When it comes to advertising, it's a given that making untrue claims, bait-and-switch offers, and the like are unethical. But those aren't the only ethical issues to consider. Advertorials, interstitial ads, pop-ups and pop-unders, contextual links, and overlay ads, all come with ethical hazards. Negative reactions can come from media companies too. They may be unwilling to accept certain ads because they will drive traffic away. The journalists' organization The Poynter Institute, for instance, says in its online ethics guidelines: "The consumer's experience is paramount. Advertising models and sponsorships should be evaluated closely to determine their impact on consumer experience." One type of advertising that can be problematic is the advertorial – an ad that's intentionally made to look like an article. This is also called native advertising. There's a longstanding rule in the publishing industry that any ad that could be confused with editorial content must be clearly labeled as an advertisement. This is true on the web just as it's always been true in print. A good example of an advertorial is the Feature by Sony campaign launched several years ago. It consisted of articles written by freelancers who presented themselves as average citizens writing about how they used technology. The articles were commissioned and paid for by Sony. They often didn't even mention Sony except in sidebars, which made them especially hard to distinguish from normal site content. But what really drew criticism was that the labeling to distinguish the articles as advertising was often in very small type, and sometimes the word "advertising" was not even used. Some types of ads are ethically problematic even if it's obvious that they're ads. For instance, in 2002, travel retailer Orbitz stirred up controversy in more than one media outlet by running kick-through ads – display ads that take the user to a site when they merely mouse over an ad. The fact that kick through ads seem to have disappeared from the web likely is due to the outcry against them. Still, reputable companies have embraced the technology – notably computer-book publisher O'Reilly. Even O'Reilly, which still uses the ads on its site, provides an FAQ explaining why they chose to use this technology and explaining how users can turn off the IntelliTxt ads, which would seem to indicate that the ads are unpopular with users. Vibrant Media argues that because paid links feature a distinctive double green underline and the pop-ups are labeled as advertising, their technique doesn't violate ethical rules. The company also says that since the links are inserted using an automated process after the article is posted online, writers can't be influenced to include particular keywords. Several media industry associations disagree, notably the business-to-business (B2B) publishing associations American Business Media and American Society of Business Publication Editors. Both have guidelines specifically forbidding the sale of contextual links within editorial copy. Another type of advertising some consider questionable are those that open in a new window. The prime example, of course, is the pop-up ad, which appears in a small window in front of the main browser window. The pop-under is similar, but appears behind the main browser window, so a user doesn't see it until they close that window. In both cases, advertisers may be hoping that users will inadvertently click on the window while attempting to close it and thus be taken to the advertiser's site. Though both forms of advertising are widely used, both risk irritating the potential customer. Research shows that pop-ups are the most hated advertising technique. Another reason not to use them is that most people block them. And although these ads have a high click-through rate, most of those clicks may happen inadvertently when people try to close the window. Pop-ups may work for content but are not well-accepted for ads. Then there are ads that look like system messages from your computer — those gray rectangles that pop up on your screen with a message and an "OK" button. The user may think clicking "OK" will close the window, but instead, it takes them to the advertiser's website. "There’s nothing good that’s going to come from that approach," says Neil Hair, an assistant professor at the Rochester Institute of Technology who has researched people's perceptions of online ads. "You’ll just make people mad. … It’s just destroying your image longer term." Younger people especially react negatively to those types of ads, he says. Interstitial or prestitial ads – pages that appear before the expected content – may also be perceived as irritating but are generally accepted if users have an option to bypass the page by clicking a "Skip this Ad" link. Overlays are ads that appear over existing content, but in the same window rather than in a new window. They're also known by brand names such as Eyeblaster or Shoshkele. They're usually Flash movies. They may feature animation that moves freely over the site content. These ads are generally disliked if they cover up content; overlay ads on video have received a mixed response. Another concern for online publishers is that all the ad types mentioned in this section may contain scripts that can crash browsers. 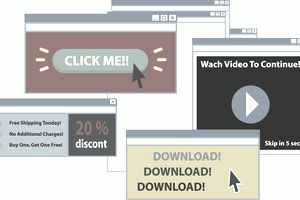 As people learn to ignore banner ads, is it realistic to ask advertisers not to use pop-ups, overlay ads, and the like? What do you do to get people to notice your ads? First, give up old ideas about the importance of click through. "The aim isn’t to get people to click because they don’t. It’s recognition," says Neil Hair of the Rochester Institute of Technology. In other words, online advertising is becoming more like traditional advertising. Hair and his colleague Susan Barnes are looking at which banner ads work and why. "It has to do with colors that are used, and whether they’re using fancy movable text, which people loathe." They also are finding that large text works better than small – so keep your message short. And finally, another technique that works is humor. The bottom line, says Hair, is to "use a softly-softly approach. You’ve got to build these relationships over time."